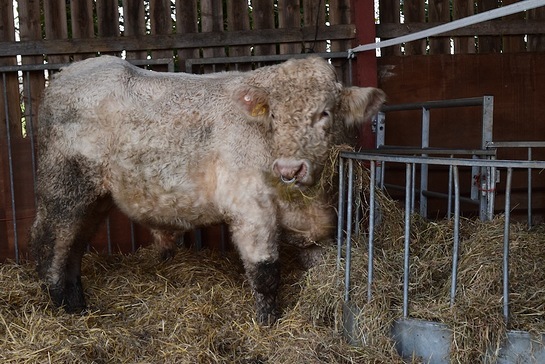 With help from PETA, the Animal Rights Action Network (ARAN) and donations from around the world – including a £5,000 gift from The Simpsons co-creator Sam Simon – Benjy, an Irish bull previously slated for slaughter because of his sexual orientation, arrived at Hillside Animal Sanctuary today, where he will breathe fresh air, graze freely and never again face the threat of the butcher’s block. “My health won’t allow me to travel to the UK to see Benjy in his new home, but it thrills me to know that his fate is a sanctuary rather than a sandwich, and I know the folks at PETA and ARAN will keep me updated on his progress”, he says. Since Simon was diagnosed with terminal cancer in 2012, he has used his resources to help many animals in need, including helping to retire a lame horse used for racing and securing the transfer of a chimpanzee who had spent more than 18 years in solitary confinement at a zoo. Just last week in collaboration with PETA US – whose motto reads, in part, that “animals are not ours to use for entertainment or abuse in any other way” – Simon helped rescue two black bears from a roadside zoo in Tennessee.